Fall is approaching, school is back in session, and people are getting sniffly. Growing up, when I was sick my parents used to make me a bowl of Campbell’s Chicken Noodle soup, or if I was really lucky, my mom would make some chicken soup with matzo balls. Whenever I am sick now, my father-in-law makes me some super spicy chicken curry. Which leads me to the point of this post: bone broth. I have made my own chicken broth (occasionally) for many years, but I usually bought it in cartons for the convenience. About a year and a half ago, I read a post by Balanced Bites about the mineral-rich goodness of bone broth. She made it sound so easy to make (she uses a large crockpot), so I tried it, and it was indeed easy and tasty. I froze my broth in 2-cup containers and had nutritious, nourishing broth that I could use for soups, sauces, or stir frys. 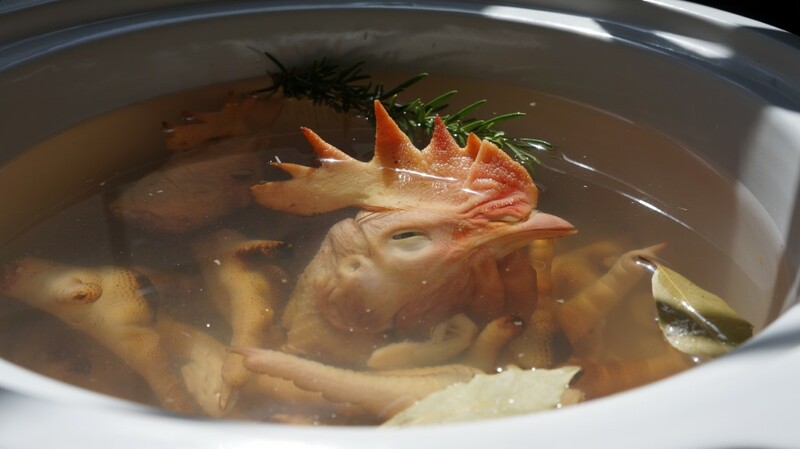 I have since made broth on a pretty consistent basis from whatever bones I have available: beef knuckle or marrow bones, entire chicken carcasses, and lately, from chicken heads and feet. This last broth was by far the best tasting and most gelatinous, a sign that I was able to extract enough gelatin to be truly beneficial and healing. Not sure if you can see it, but my broth “gelled.” Love that jiggly goodness! You may remember my post about visiting a farm to get some jungli murgha. 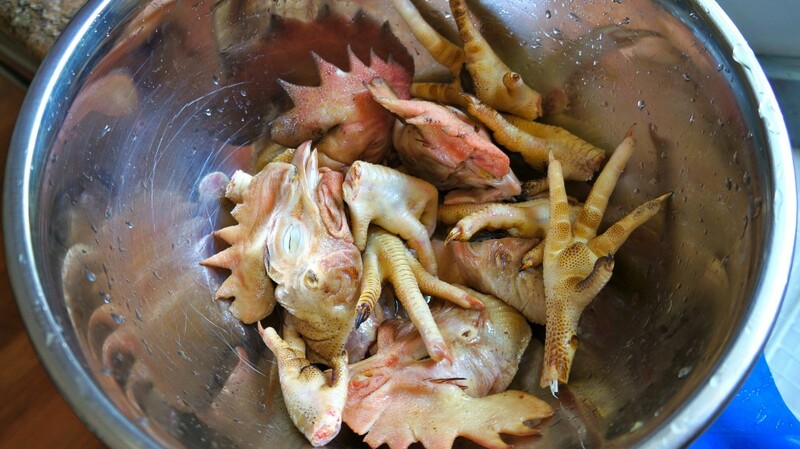 When we got the chickens from the farm, I requested the feet and heads (which are normally discarded), knowing that I could use them to make some chicken broth, and reasoning that if I paid for it, I might as well use it! 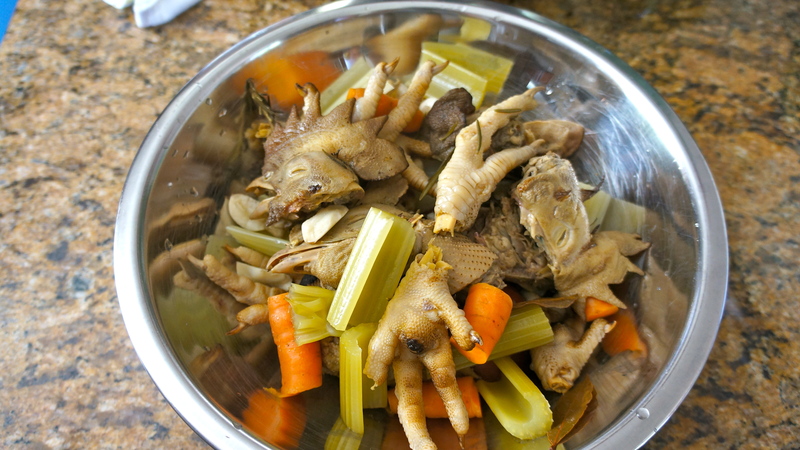 So I used the heads and the toes to make broth…and I ate the shoulders and knees (if those are even real chicken parts?!). 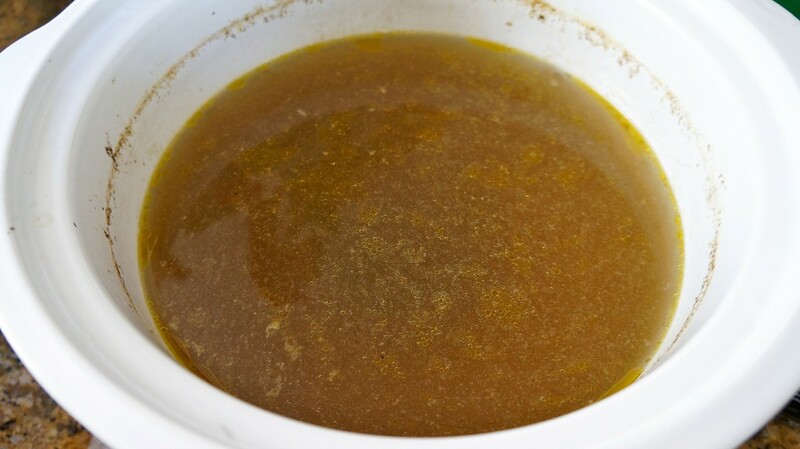 Homemade broth has become a staple in my cooking, and I have used it in more dishes than I used to because I want to add extra nutrition and flavor. I have even sipped a mug of hot bone broth on days that I feel a cold coming on or when my throat is a bit scratchy. It never fails to warm me, soothe my symptoms, and help me to feel better more quickly than if I just drank extra water or tea. It truly is a healing food, the Jewish penicillin, and one of the easiest things to make for yourself. 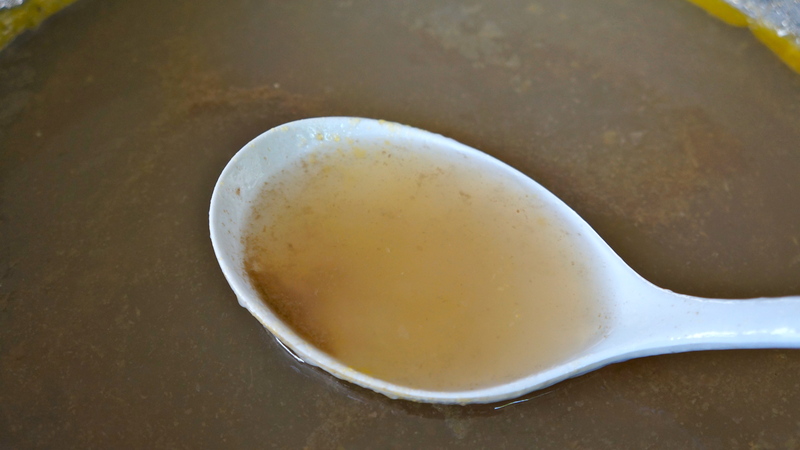 A parting word about store-bought broth: I think it’s garbage. I know, it’s super easy to use, shelf-stable, and not very expensive…and I used to buy it all the time. But it almost always has MSG or other flavor enhancers, stabilizers, preservatives, and sugar. It is not likely to be cooked long enough to extract the minerals and gelatin from the bones, and it will never, never, never taste as good as homemade. And while cans or cartons of broth don’t cost very much, you can make your own from leftover carcasses or “undesirable” chicken parts for just a few dollars. Really. Your taste buds and your body will recognize the difference and respond with improved health and vitality. What do you have to lose? Rinse your chicken parts in cool water; drain well and then put them in a large crockpot (at least 5-7 quart capacity). Add filtered water until it fills the crockpot to about 1 inch from the top, plus 2 Tbsp. of apple cider vinegar (this helps to extract the minerals from the bones). Add the garlic, onion, rosemary, bay leaves, carrots, and celery to the broth. Stir a bit, then put the lid on the crockpot, and turn it on to HIGH. When the broth reaches a boil, turn the crockpot to LOW and walk away. Let it go for 6-24 hours. I usually start my broth in the evening and let it go overnight. When it has cooked as long as you would like it to, turn off the heat and let it cool a little. Remove the large pieces of chicken and vegetables and discard. Then strain it with a fine mesh metal strainer and let it cool completely. If you would like, put the broth in a large glass or metal container to cool in the refrigerator; the fat will rise and solidify at the top and can be skimmed off easily. This is completely optional! Pour your strained and cooled broth into glass containers for storage in the fridge (for up to 3 days) or into plastic freezer-safe containers for longer storage. I like to store mine in 2-cup containers since that is the amount I use most frequently at any given time. Enjoy your delicious, nourishing bone broth as a base for soups, stews, and stir frys or as a warm beverage when you are feeling cold and/or sniffly. Your body will thank you! Note: Some people find that the vegetables become bitter when they are cooked for a long time. I have not experienced this, but you can omit them and make broth with whatever seasonings (or none) that you like. Hello, Mr. Rooster! Getting ready to turn on the crockpot. Finished broth: rich in color, flavor, and minerals! For additional reading and/or instruction, read Broth is Beautiful or visit The Healthy Home Economist. This post is linked to Monday Mania and Real Food Wednesdays. 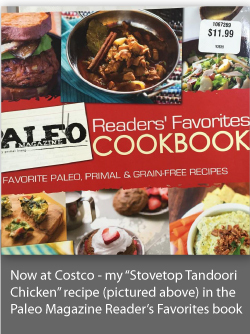 Thank you for sharing this great recipe, explanation, and including pictures! I have bought bone broth from The Wellness Kitchen in Templeton and it truly is so healing! I never knew how to make it though… this is really interesting to me! I always assumed it was just the carcass that was used, the parts of the carcass never occured to me. I will be giving this more thought as fall is quickly approaching. I don’t know if I’m brave enough to try making it myself yet, but I’m always thinking about how I can live more sustainably and I so appreciate the value of whole, real foods! Thanks Rebekah! You’re welcome, Brandy! And you can use pretty much any bones you have, but I do like the flavor and gelatin you get from chicken feet! I’ll bet you could find some from a local farmer–you could even ask The Wellness Kitchen where they source their ingredients.